Milford Haven rally drive Nick Cristofaro had a disappointing end to his British Rally Championship season when a broken driveshaft led to his retirement from the Trackrod Rally Yorkshire while leading the Fiesta SportTrophy class. Having successfully tested his Genpower UK, Ginsters, Cristotec, Autoglym, Millers Oils, Nicky Grist and Elite Remapping-supported Ford Fiesta ST in Hamsterley before the event Cristofaro had high hopes of ending his season in style with a Fiesta win on the Scarborough-based event. The rally kicked off with a 14 mile stage in Dalby forest, a forest where there are several long straights which suit the more powerful Fiesta R2 cars rather than Cristofaro’s older ST model. 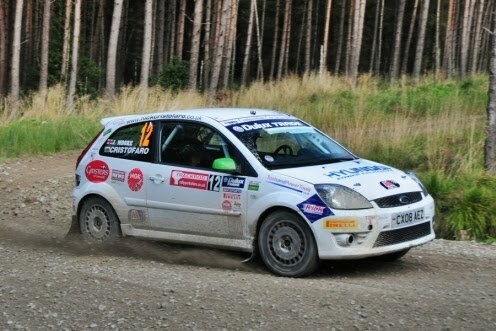 Despite this he managed to finish the stage in third place in the Fiesta class. The next four stages, two runs of Gale Rigg and one of Cropton and Staindale were shorter and more technical. Cristofaro overcame his relative lack of power to storm to three fastest Fiesta times and one second fastest, a performance which saw him head the Fiesta SportTrophy leaderboard. Sadly the chance of a Fiesta win for Cristofaro vanished when a loud bang at the start of the next Langdale stage signalled a broken driveshaft which forced him out of the event. Please visit www.nickcristofaro.co.uk or join the Facebook group www.facebook.com/NickCristofaroRallying for all the latest news and photos.